Here at Bouden Coach Travel, we have an evergrowing fleet of vehicles that are available 24 hours a day, 365 days a year. From cars, MPV’s, minibuses, midi coaches to full size coaches we are sure to have a vehicle to suit you! When using Bouden Coach Travel you will receive only the best in passenger transport. When booking an executive chauffeur car service with Bouden Coach Travel you will receive one of our Mercedes E-Class cars or equivalent. Comfortably seating 2-3 people with a luggage capacity of 2 large suitcases. You may ask what is AdBlue? AdBlue is a solution made up of urea and water injected into the car’s exhaust system before harmful nitrogen oxide comes out of the exhaust pipe. Our vehicles come complete with this technology which helps limit exhaust emissions, therefore making our chauffeured cars good for the environment. These vehicles will be less than 2 years old, have a plush and luxurious leather interior with fully functioning air conditioning and climate control. They are perfect for corporate travel, weddings, airport transfers, business travel and transporting VIP’s. Our professional uniformed drivers will pick you up and drop you off at any convenient location so you can be sure to arrive in style. Our MPV’s are ideal for small groups of up to 6 people. 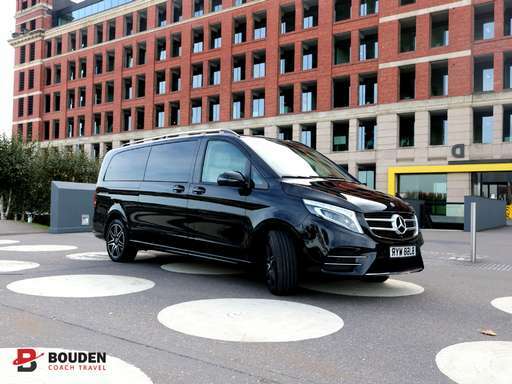 The Mercedes V-Class vehicles that we use are the all-new design, replacing the very popular Vito which is commonly used for corporate/business hire as well as airport transfers, transporting VIP’s and much more. They come complete with lavish interiors which include leather seats, air conditioning, spacious boot big enough for 6 check-in cases and small hand luggage, tinted windows and pull out tables perfect for corporate travel. With these vehicles you will be travelling in true comfort, suited to long journeys, our MPV’s have been taking passengers across the UK and even international. Our minibuses are one of our most popular choices of vehicle, we have many different sizes and styles to suit your group. Here at Bouden Coach Travel we take pride in offering our clients only the very best when it comes to transport and our minibuses do just that. Our minibus fleet consists of Volkswagon Krafters, Ford Transits, and Mercedes Sprinters, available in standard, executive and luxury classes you can be sure you arrive in style! For larger groups who want to travel together, we offer our midi coach options. Varying in sizes they are perfect for hen do’s, stag do’s, birthday bashes, nights out, weddings and tours, they come with custom interiors built bespoke to us. Not big enough to accommodate a toilet, but spacious enough to be very comfortable, these are available in standard, executive and luxury options. We have midi coaches in the form of Mercedes Plaxton Cheetahs, Mercedes Ategos, Mercedes Benzene, Mercedes Riada, Iveco Turas, Mercedes Beluga and Mercedes Sprinters. Now with our new license, you can request one of our midi-coaches to take you international! Our vast in-house fleet of coaches are a force to be reckoned with, available in different sizes ideal for accommodating large groups on many different journey types. Our coaches are available in standard, executive and luxury classes, standard vehicles are used for simple A to B journeys and are just that, standard! With our executive and luxury vehicles they benefit from features including; fully functioning toilet on board, wheelchair access, full/part leather seating, air conditioning, climate control, TV, CD and DVD players and even kitchen areas when specially requested. This makes them well suited to day trips, tours and many other types of passenger transport. Coaches that we use frequently include Mercedes Tourismo, Volvo Plaxton, Scania Irizar, VDL, Iveco Magelys, and Iveco Evadys. If you need safe, fast and efficient ground transport Bouden Coach Travel should be your first port of call. It would be our pleasure to assist you. In order to provide you with a fully comprehensive quotation as quickly as possible, please let us know where you are travelling from and to, how many passengers will be travelling, if they will have any luggage with them and what date you are planning to travel. If there is anything that you would like to specifically request such as a vehicle with tables, a vehicle which is unbranded, please let us know so that we are able to let you know the availability of specific vehicles in the first instance.